Hungary suffered a shock 1-0 defeat away at Andorra in their latest 2018 FIFA World Cup qualifier tonight, Marc Rebés’ looping far-post header from Chus Rubio’s right-wing cross in the 26th minute proving enough to overcome Bernd Storck’s men on a night when nothing at all went right for the visitors. 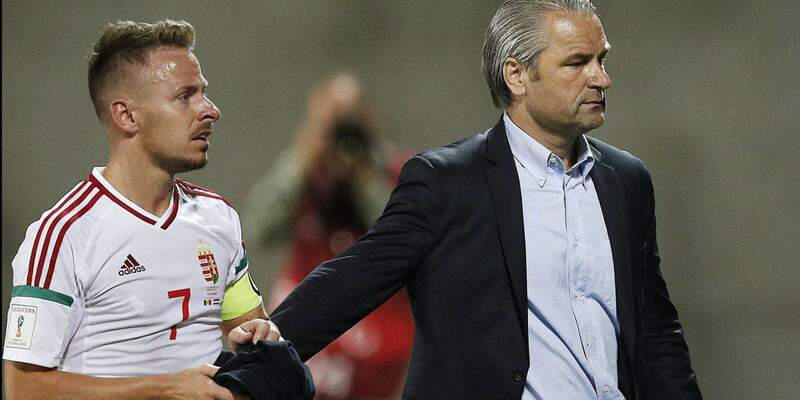 Hungary, beset by injury problems which ruled out proven performers such as Tamás Kádár, Ádám Szalai, Mihály Korhut, Tamás Priskin, Dániel Böde, Attila Fiola, Ákos Elek and Richárd Guzmics, were also without the suspended Zoltán Gera so the national team started the match with one of their most inexperienced lineups ever, a situation exemplified by debutant Bence Tóth at left-back who was playing his first international match before he’d even played in the top tier of club football (his club being Puskás Akadémia which has just been promoted from the Hungarian second division). Furthermore they were dealt another blow when winger Zoltán Stieber was forced to succumb to a hamstring injury, possibly caused by the artificial pitch which Andorra have dispensation to use, after just 20 minutes, youngster Dominik Nagy replacing him. As is customary with Andorra, they sat very deep in an attempt to soak up pressure. Ádám Gyurcsó went close with a free-kick and striker Márton Eppel nearly latched on to a long through-ball, but a goal for the away team was not forthcoming. Rubio reaching the byline with a lung-bursting run and crossing for the arriving Rebés who somehow evaded Barnabás Bese and Paulo Vinicius and looped back a header high over goalkeeper Péter Gulácsi and into the net via the far right post. Hungary’s first chance to equalise came only four minutes later when Tóth slipped the ball inside for Eppel just inside the Andorra area but his low short was superbly saved by Andorran goalkeeper Josep Gomes low to his right. Storck’s team tried hard to break down the 11-man Andorra defence but nothing was falling their way, a trend which continued into the second half. To Hungary’s credit they at least tested Gomes several times but the home keeper was having an outstanding night, saving fabulously from Dzsudzsák’s low volley from a tight angle, beating away substitute Dominik Nagy’s fierce drive and bravely smothering Dzsudzsák’s improvised shot with his knee when a pass over the defence found the Hungary captain alone just eight metres from goal. Meanwhile yet more youngsters arrived from the bench in the form of Palermo duo Norbert Balogh and Roland Sallai, but despite their best efforts Hungary couldn’t find an equaliser and therefore left the principality with no points on this occasion. Hungary remain third in the qualifying group with seven points, eight behind Portugal in 2nd place and a further two adrift of Switzerland in first, but on the plus side two points clear of the Faroe Islands in 4th spot. Hungary (surnames first): Gulácsi Péter – Bese Barnabás, Vinicius Paulo, Lang Ádám (Balogh Norbert, 55. ), Tóth Bence – Nagy Ádám – Dzsudzsák Balázs, Kleinheisler László, Stieber Zoltán (Nagy Dominik, 20. ), Gyurcsó Ádám (Sallai Roland, 71.) – Eppel Márton.